Following the World Bank’s decline to fund building the Aswan High Dam, Egyptian leader Gamal Abdel Nasser nationalizes the Suez Canal sparking international condemnation. After the United Kingdom and the United States withdrew their pledge to support the construction of the Aswan Dam due to Egyptian overtures towards the Soviet Union, Egyptian President Gamal Abdel Nasser nationalized the canal in 1956, intending to finance the dam project using revenue from the canal, while at the same time closing the Gulf of Aqaba to all Israeli shipping by closure of the Straits of Tiran. This provoked the Suez Crisis, in which the UK, France and Israel colluded to invade Egypt. The intention was for Israel to invade on the ground, and for the Anglo-French partnership to give air and other support, later to intervene to resolve the crisis and control the canal. To stop the war from spreading and to save the British from what he thought was a disastrous action, Canadian Secretary of State for External Affairs, Lester B. Pearson, proposed the creation of the very first United Nations peacekeeping force to ensure access to the canal for all and an Israeli withdrawal from the Sinai. On 4 November 1956, a majority of nations at the United Nations voted for Pearson’s peacekeeping resolution, which mandated the UN peacekeepers to stay in the Sinai Peninsula unless both Egypt and Israel agreed to their withdrawal. The US backed this proposal by putting financial pressure on the British government, which then agreed to withdraw its troops. Pearson was later awarded the Nobel Peace Prize. 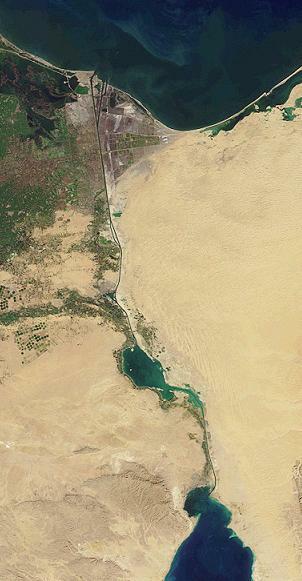 The Suez Canal was opened in 1869, having been financed by the French and Egyptian governments. Technically, the territory of the canal proper was sovereign Egyptian territory, and the operating company, the Universal Company of the Suez Maritime Canal (Suez Canal Company) was an Egyptian-chartered company, originally part of the Ottoman Turkish Empire. The canal was strategically important to the British, and hence to the other European powers. To the British, the canal was the ocean link with its colonies in India, the Far East, Australia, and New Zealand. Because the canal was strategically important, the area as a whole became strategically important. Thus, in 1875, the British government of Benjamin Disraeli bought the Egyptian share of the operating company, obtaining partial control of the canal’s operations and sharing it with mostly-French private investors. In 1882, during the invasion and occupation of Egypt, the United Kingdom took de facto control of the canal proper, finance and operation.